​Philadelphia 76ers star ​Ben Simmons is hoping to meet with ​​Los Angeles Lakers legend and current president of basketball operations Magic Johnson this summer in order to learn from the former point guard. Simmons, much like Magic, is a rare example of a "big" guard, and likewise works his offense through superior vision and efficient finishing as opposed to prolific jump-shooting. Johnson responded to the request saying that he was willing to help develop Simmons' game... before going on to compliment the 22-year-old's talents at length. Learning from this all-timer could help to bring Simmons' game to the next level, as the two exhibit similar play styles and body frames. Johnson was never much of a three-point artist during his days in the league, and Simmons has still yet to connect on a shot from beyond the arc over the course of his young career. 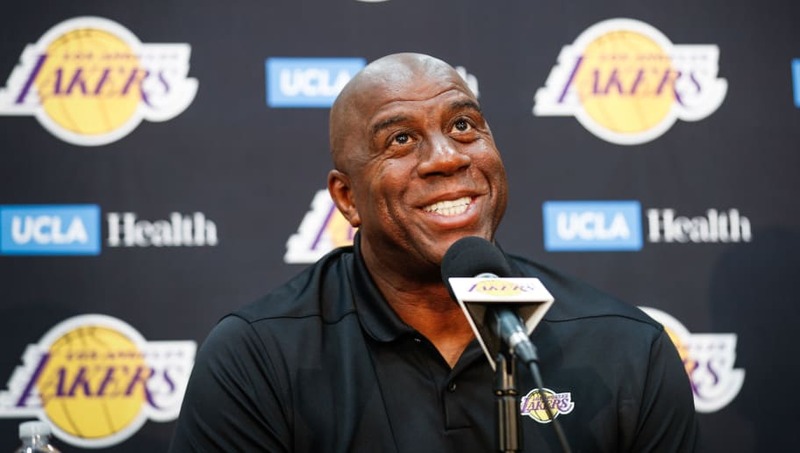 The Lakers' open desire to add talent to their roster has occasionally flirted with the boundaries of tampering, and observers around the league are practically waiting for them to slip up again. With that in mind, Johnson should be extremely delicate with how he handles this situation with Simmons-- more delicate than he's currently being. While nothing Johnson has said as of yet has been dyed-in-the-wool tampering, one can only imagine the pitch he would give to Ben Simmons to bring him to Los Angeles if given half a chance. We already know Lebron James is eager to add some big names to this Laker squad, so he would likely be on board with adding Simmons to the mix. But at what cost? Tread lightly, gentlemen.